Transform the impact you achieve through the spoken word so that you connect, influence and inspire the people who matter to you in your leadership role! Learn how to speak powerfully and persuasively! 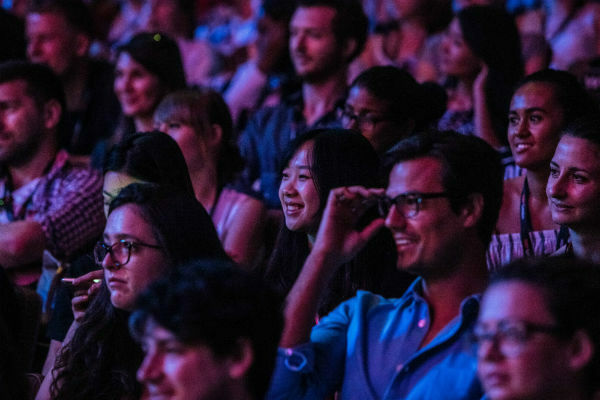 "In helping us prepare for a series of investor-critical presentations, Simon worked one-to-one with our entire team of speakers over several months. Simon made a significant and permanent difference to our people's effectiveness as speakers." "I first worked with Simon to create a personal impact programme that has been so successful that we are now running it a sixth time." "Simon has supported DPD over the last three years to great success - he's the 'Go To Man' for Senior Managers in our business who want to develop their presentation skills"
Simon remembers from his Oxford University days the impact made by great speakers who visited the university from the world of business, from academia (of course) but also from politics and entretainment. At the time he assumed (wrongly!) that the impact they made was a gift rather than a skill! Years later, in 2001, in his first job in a Senior Executive headhunting company, he fluffed a leaving drinks speech. This experience was so painful for him that he vowed to overcome it. Five years later he stood on the stage in Washington DC representing UK & Ireland in the World Championship of Public Speaking. Since that time he has worked with more than 1,000 executives from over 100 countries all over the world and helped many others within 20+ countries during the last ten years. Today Simon offers not only One-to-One Public Speaking Coaching for High Achieving Executives face to face, as well as online and phone, plus in-house Public Speaking & Presentations Skills courses for companies, but NOW this progress can be reinforced by his comprehensive video programme of 9+ hours. Here you can access coaching at times to suit yourself and brush up on your Public Speaking and Presentation Skills. This comprehensive video programme consists of 9 core modules within each of which are three 10-15 minute videos. There is also a series of FAQs drawn from discussions Simon has had with executive clients around the world. These are accompanied by Executive Summary videos on core topic areas and 2 interactive interventions focused on how to really achieve clarity with your messaging fast and how to hone critically important skills for delivery where it feels as if you and Simon are working together through the camera lense. there are some case study videos showing sample stories from various presentations and sessions that he has delivered so that you can see how the stories actually work in action. As we all know. for any leader, the ability to tell stories in an appropriate and effective way is absolutely vital. Finally you'll get access to some of Simon's top tips for handling and addressing 7 of the most critically important mistakes that he sees executives make in their communication. 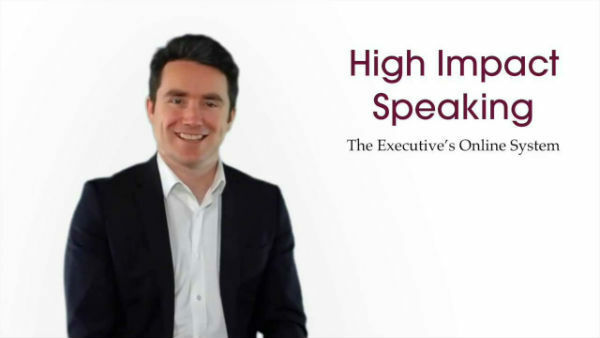 The High Impact Speaking System is Comprehensive, it's Practical drawn from first hand experience of what works and it's Focused on Transforming the Impact that You Achieve So that You Can Connect With, Influence and Inspire the people who matter to you in your leadership role whether business or personal. With experience coaching C-level executives at the highest level and across 20+ countries, clients include HgCapital, CIMA, DPD, General Electric, London Business School, the Laing O'Rourke Centre for Construction Engineerding & Technology at Cambridge University and The Royal Academy of Engineering in London. "Simon is in a class of his own. He is public speaking." "I was recently promoted into a role where public speaking and inspiring people has become more central to my ability to be effetcive. I was amazed by how effective just one session was. I heard indirectly that my presentation had been particularly inspirational - one person even contacted the Director of my organisation to say how impressed he had been. Without any exaggeration, I give all the credit for this success to Simon." You tailored your advice to meet each entrepreneur's needs and your coaching made a real difference to this year's event." "In 2018, Simon coached me with public speaking, style, helped write my pitch... gave me every imaginable tip to manage my nerves, present with esteem, conviction and win over the audience... I cannot recommend him more highly to any CEO or senior executive looking to perfect their public speaking and win over an audience." The ability to present well is a must-have for any high potential leader with serious ambitions. Being senior and knowledgeable is not what counts. Possessing the skills to won hearts and minds is! "Simon's workshop on Creating Impactful Communications generated great feedback and a strong level of engagement with the audience. It was clear that he understands just how to tackle a number of the communications issues that senior exectives face throughout their careers. "Working through this video program has made a huge difference to my speaking. After my conference presentation, I had so many executives telling me: 'I want you to come and work for my organization'. It just goes to show the power of impactful speech... I can't count how many people told me my presentation was THE best." Simon, you opened my eyes to a whole concept in my speech I was yet to uncover. I can now absolutely see why you have the reputation that you do. To say I am thankful is an understatement.